Living Waters Aeration introduces The Watercannon portable swimming pool aeration system. These high-volume, adjustable waterfalls provide beneficial oxygen to the water and eliminate dangerous bacteria and algae. Reduce chemical usage and cool your pool an average of 10 to 12 degrees. There are two models available. The Watercannon 1.5 runs on 120 volts and pumps 110 GPM (gallons per minute). The Watercannon 3 runs on 220 volts and pumps 160 GPM. Paragon Aquatics Track Start Plus+ offers upgrade kits that easily retrofit to and enhance your existing Track Start platforms with an adjustable back plate and hand grips. The slide assembly and locking pin assembly make it easy to remove or reset the back plate, even during a race. Also helpful for training purposes, allowing coaches to decide when (age/skill level) to introduce these enhancements. This new option can also be used with "take-off" sensor platforms from timing equipment manufacturers. "The Solution" Feed Systems, adjustable wide range liquid chemical feeders designed to improve operational safety and simplify the disinfection process while reducing operating costs. Features high-capacity feed with venturi mixing, providing for excellent chloramine control and effective point source pathogen deactivation under the heaviest demands. Systems are virtually maintenance-free, carry a complete warranty and are certified NSF/ANSI Standard 50. 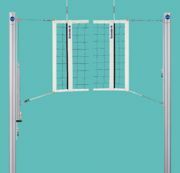 Built to last a lifetime, easy to use every day, the Schelde Collegiate 4000 Net System combines ultra-light weight with innovative engineering that has made it one of the most popular volleyball net systems in the sport. Designed to be easily set up by one person in five minutes or less. Duraluminum posts and linear winch come fully assembled and carry a limited lifetime warranty. Guaranteed net height. Top competition outdoor systems are also available. Adventure Golf Services is now an authorized dealer of My mini Golf, the first crossover "play anywhere" miniature golf game. Setup is simple: Place the weatherproof, plastic-cast obstacles randomly on nearly any indoor or outdoor surface, and you're ready to play, from basement to playground for those age 3 through retiree. There are 13 different, lightweight, easy-to-store obstacles and targets, such as the "maze," the "360-degree loop" and a simple cup used for practice, available in two different colors. Inter-Fab Inc.'s new self-operable i-LiftTM pool lift meets the new ADA requirements for commercial swinning pools and spas. The most affordable solution for ADA compliance, the i-LiftTM offers a wireless remote control as a standard feature. The unit is battery-operated with a low-battery warning light and manual override switch, and delivers up to 90 lifts at maximum capacity on a single battery charge. Easy to install, the i-Lift can be removed without tools when not in use. Newstripe's SafeMark field layout system is the safest way to lay out any athletic field and eliminates measuring year after year. There are no holes to catch cleats or plugs to trip over. The SafeMark high-density foam locators can't rust or be destroyed by aerators, mowers or vehicles. The UV protected foam matches the texture and feel of natural turf. They are so safe, they can even be installed within the field of play. Once installed with the supplied auger, the 2.5-inch diameter markers make locating key field layout points a snap. A unique anchor holds the markers permanently in place, preventing vandalism. The award-winning Total Gym GTS is utilized with the GRAVITYSystem®, a staple personal training, group fitness and Pilates program, available in 1,500 commercial facilities with 5,000 GRAVITY instructors worldwide. Features include 22 calibrated levels of resistance with loads from 1 percent to 62 percent of bodyweight. All new aluminum extruded rails provide smoother, quieter gliding and increased rolling range. 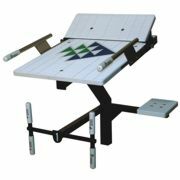 Also features simplified gas strut assisted folding and unfolding, a release lever for easy level changes, and all new glideboard that adjusts parallel to floor and allows for improved spinal alignment.